at the Australian National Maritime Museum in Sydney. Seven outstanding quiltmakers and practitioners will speak on Sunday on a wide-variety of topics including keynote speaker Di Ford, who will be talking about 19th Century Inspirations in Quiltmaking. Margaret Rolfe, founder of the Quilt Study Group of Australia is the guest speaker at the Seminar dinner on Sunday night. On Monday 7th, quilts will be uncovered as four well-known quiltmakers reveal their collections. Please refer to previous 'Template Free' blog post for full details of Seminar Programme. All are welcome to attend this important Celebratory Seminar. 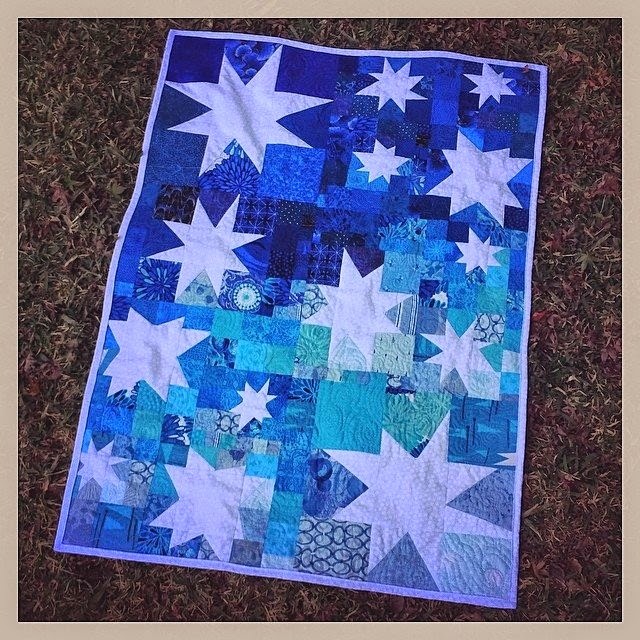 Thanks to "Under 35" quilter Leigh Davenport Jurd for the image of her entry. Come and see this quilt and other spectacular entries in The Under 35's Quilt Competition Exhibition. "Sold" stubs and Unsold tickets needed to be returned to the Office of The Quilters' Guild of NSW Inc by today Friday 27 June. If this deadline was missed then (for legal reasons) they must be given in to the Raffle Desk at the show. Exhibition on this weekend Saturday 28th and Sunday 29th June at Newington College. Membership must be renewed from July 1st. Please fill in an application form at the Quilt Show if payment has not already been forwarded to the Guild Office. 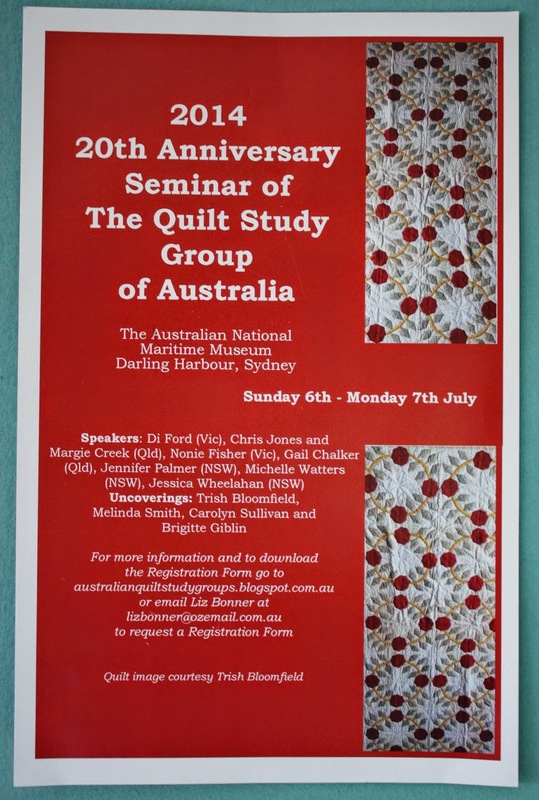 Join Quilters from across Australia at The Australian National Maritime Museum, Darling Harbour. Everyone on Duty on "Set-Up" Day Tuesday 8th July and Show "Take-Down" Sunday 13th July must wear closed-in shoes. Monday-Tuesday August 4th-5th. Join Bob James for his silk foundation pieced "From Indigo to Silk" workshop. Enquire now for a list of workshop requirements and enrol by filling out a Workshop Application form, as found in The Template. Phone the Guild Office or email Meeting Co-ordinator Meg Orr to book a Trading Table at the General Meeting 16th August. Please fill in a booking form from The Template May edition. Do not leave registration until too late. Sydney Quilt Show Jelly Roll Race programme needs filling. Can you and pals beat the record of 20 minutes 58 seconds? Will Keduba Quilters be back to defend their title? Will there be colourful language quilting on the exhibition floor? Contact the Exhibition Secretary if you want to be part of this hilarious activity, scheduled for the Friday, Saturday and Sunday, at 12.30pm. Seen in the image above is "Zoe" aged 12 and from interstate. 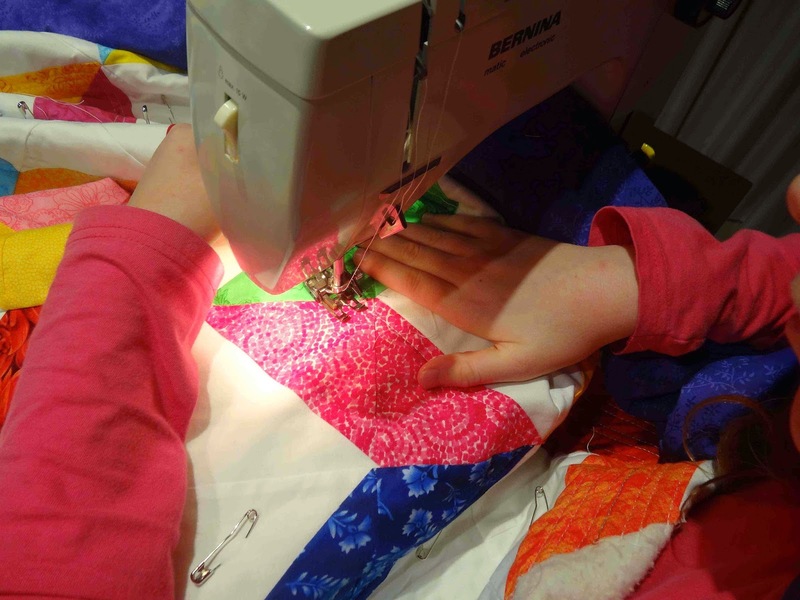 This is her second involvement with this Competition and she can only quilt in the evenings after helping her Mum with younger siblings, after her home work is done and after cello practise! Thankyou to Zoe for being our Model and good luck to all in the competition. Our 2014 Sydney Quilt Show is fast approaching, and we are in need of more volunteers for all areas of the Show. 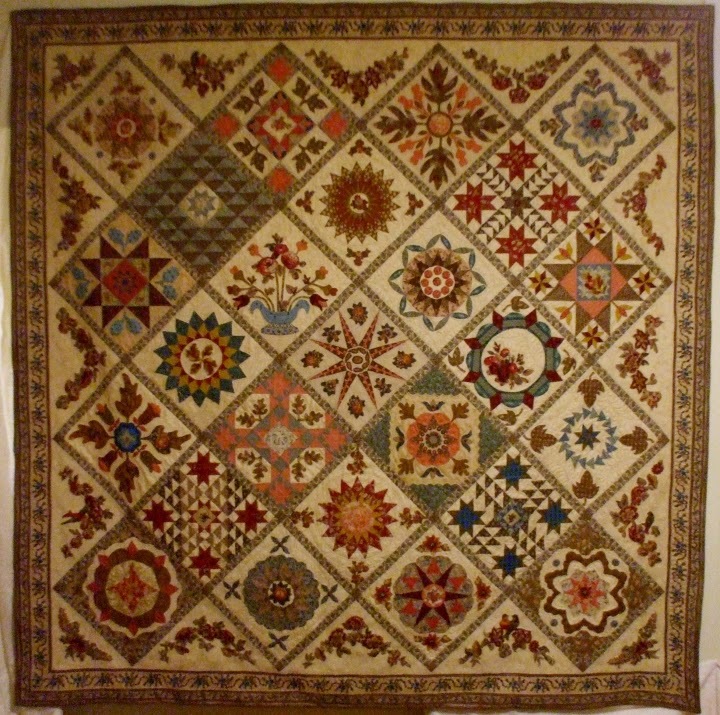 If you have entered a quilt in the Show, it is expected that you will volunteer for at least two shifts during the exhibition. ***All volunteers at Set up and Take Down must be over the age of 16 years. Unfortunately children will not be allowed on site at these times. The Quilt Show is considered a “construction site” at these times – fluoro vests (supplied by Guild) and closed in shoes must be worn by all volunteers. The Guild would greatly appreciate knowing if your husband, son, brother, uncle, cousin – anyone with a bit of extra physical strength can help at Set Up and Take Down. The days and times you are able to work, First Name, Surname, Full Address, Postcode, Home and Mobile Phone numbers, Email. Please also indicate if you have trouble standing for long periods and we will assign you a sit down job. Please complete a volunteer form if a family member is coming to assist at Set Up or Take Down. A quick response will greatly assist the Show Committee finalise the rosters, and all volunteers will receive a letter of confirmation of their time slot. Our Show volunteers are the eyes and ears of the Quilt Show, and are necessary to help protect the displays. On Monday, quilts will be uncovered as four well-known quiltmakers reveal their collections. An extremely proficient quilter whose story encompasses details of the early beginnings of the quilting movement, groups, guilds, and bees in NSW. Exploring the relationship of textiles, art and quiltmaking, whilst referencing Fashion, Modern Art, Design and original creative process. Founding Convenor of the Quilt Study Group of Australia and Guest Speaker at The 2014 20th Anniversary Dinner. All quilters and friends are most Welcome!